The ability to accurately locate pipeline leaks has been a costly problem for many years. Recently, concern has dramatically increased due to more stringent government regulations, increasing public concern for environmental impact, cleanup costs and potential liability to industries using pipelines to transport their products. Despite ongoing improvements in construction, welding, coatings and corrosion protection technology, pipelines can still develop leaks. 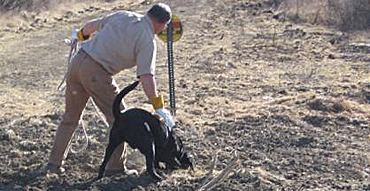 Our leak location system uses a novel, odorized test fluid, and detector dogs trained to indicate the presence of the odorant after it has been forced from the leaks in the pipeline and migrated to the surface. Since the implementation of this system, dogs have found leaks buried as deep as twenty feet emanating from holes so small they could not be visually detected. Although several different techniques are available for use in detecting leaks, many of them have distinct handicaps in their application under field conditions. Using K-9s to detect these leaks has proven to be the easiest, quickest, and most cost effective means of finding and repairing damaged pipelines.